Small things can throb in our insides for a long time. What cracks, what dents appear in the density of everyday pressures and ageing? Why is the body sometimes sensitive to every sound? Internal Terrains explores life as a choreography of decades, in search of what’s at stake as we move from one decade to another. 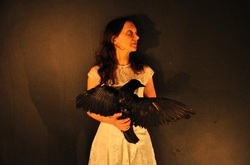 Poetic and sensual, the performance plays chords with films and installations, crows, cages and electric shocks. Developed partly in the studio and partly through workshops with local residents, who generously shared stories and worked with Natasha to translate them into visual metaphors around body, memory and identity. Natasha Davis has presented performances, films and installations in numerous venues and festivals in the UK and internationally, most recently in Greece, Ireland and Madison, Wisconsin. A visiting lecturer at Birkbeck and Brunel, Natasha has delivered talks and workshops across the world and is a practice-as-research PhD student at the University of Warwick. Created, written and performed by Natasha Davis in collaboration with: Bob Karper (sound), Branislava Kuburović (written documentation), Elisa Gallo-Rosso (objects), Lucy Cash (movement) and Marty Langthorne (lights).